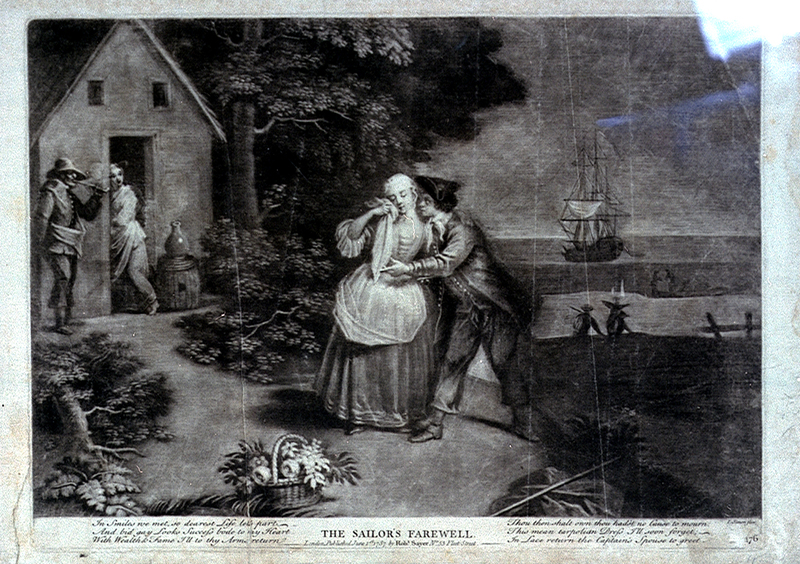 The Sailor's Farewell, Robert Sayer, 1787, National Maritime Museum. Revisiting the familiar trope, Sayer's take on the sailor's farewell is a bit more romantic than most. Judging by the fellow puffing at his pipe by the doorway, this scene most likely takes place in Holland. 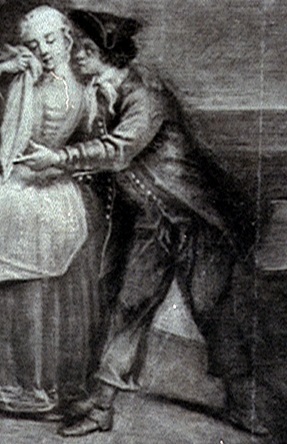 The tar at the center of the piece plants a kiss on the cheek of his lass, but his posture shows that he is pulling away toward his ship in the background. The demure woman wipes away her tears, neglecting the basket that is positively overflowing with flowers. Our romantic mariner wears a reversed cocked hat, white neckcloth, and a single breasted jacket with metal buttons and slash cuffs. Beneath that is his single breasted waistcoat with matching buttons. The trousers end at the bottom of the calf.